Environment • Ogden is first city to receive Sudweeks Award for restoration. 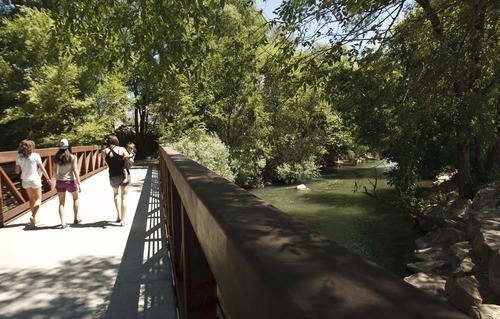 Leah Hogsten | The Salt Lake Tribune The Ogden River Parkway is now a popular and refreshing amenity, attracting joggers, bikers, moms with strollers, dog-walkers, kayakers and even swimmers and floaters. 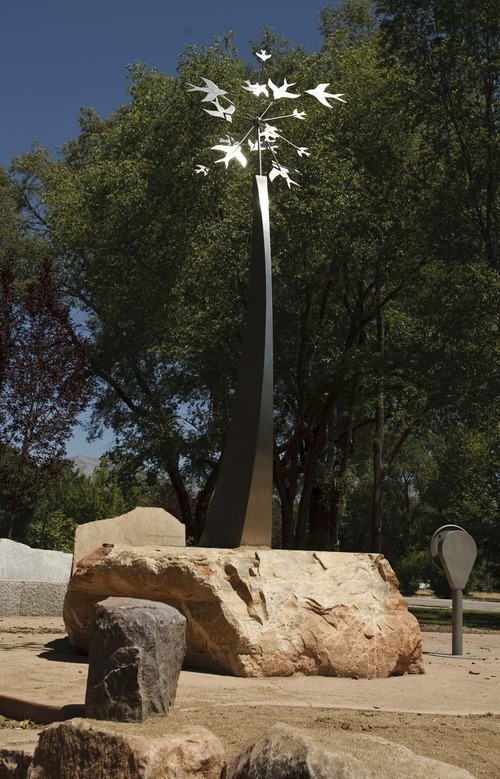 Utah's Water Advisory Board honored Ogden City with its prestigious Calvin K. Sudweeks award for restoration of a 1.1-mile stretch of the river through the heart of the city's downtown between Washington Boulevard to just below Wall Avenue. Chris Detrick | Tribune file photo Part of the Ogden River Restoration Project between Washington Boulevard and Gibson Avenue in 2011. The $7 million project cleared the channel, reinforced banks and created a green zone with native vegetation along the 1.1 mile length of the waterway. Leah Hogsten | The Salt Lake Tribune The Ogden River Parkway is now a popular and refreshing amenity, attracting joggers, bikers, moms with strollers, dog-walkers, kayakers and even swimmers and floaters. Utah's Water Advisory Board honored Ogden City with its prestigious Calvin K. Sudweeks award for restoration of a 1.1-mile stretch of the river through the heart of the city's downtown between Washington Boulevard to just below Wall Avenue. Leah Hogsten | The Salt Lake Tribune The Ogden River Parkway is now a popular amenity, attracting joggers, bikers, moms with strollers, dog-walkers, kayakers and even swimmers and floaters. Utah's Water Advisory Board honored Ogden City with its prestigious Calvin K. Sudweeks award for restoration of a 1.1-mile stretch of the river through the heart of the city's downtown between Washington Boulevard to just below Wall Avenue. 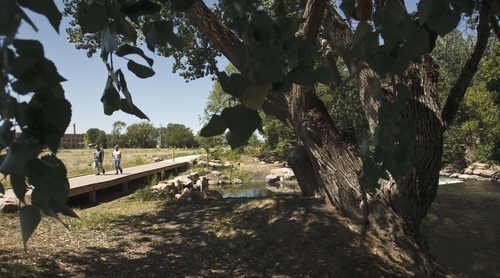 Leah Hogsten | The Salt Lake Tribune The Ogden River Parkway is now a popular and refreshing amenity, attracting joggers, bikers and even swimmers and floaters. Utah's Water Advisory Board honored Ogden City with its prestigious Calvin K. Sudweeks award for restoration of a 1.1-mile stretch of the river through the heart of the city's downtown between Washington Boulevard to just below Wall Avenue. In October 2010, former Ogden Mayor Matthew Godfrey asked the state Water Quality Board for a $1 million hardship grant to finish restoration of a 1.1-mile section of the Ogden River. The board obliged. The two year cleanup, completed in late 2011 at a total cost of $6 million, was recognized by that same panel Wednesday as former Water Quality director Calvin Sudweeks bestowed the prestigious award bearing his name on Weber County's largest city. "Ogden city is to be commended for its unprecedented vision and leadership in bringing this important project to fruition," Sudweeks said of the collaborative effort that resulted in removal of 13,000 tons of concrete, trash, glass and auto bodies  along with 2,500 old tires  from the stretch of river that flows east to west through downtown, from Washington Boulevard to just below Wall Avenue. Reached by phone Wednesday, Godfrey called the award "a great honor, especially from an organization that was so helpful in making it a reality." "It was highly controversial at first," he said of the project he introduced a dozen years ago to redevelop several blocks around the Ogden River. "We never would have been able to clean up the river without cleaning up what was around it." City engineer Justin Anderson, 36, accepted the award Wednesday on the city's behalf and described his first river restoration project as a "dream come true." "These don't happen every day," Anderson said. "It has been unbelievable to peel off the layers, clean it up and see what it naturally is." In addition to debris removal, the river's banks were stabilized, natural vegetation was restored, and 11 pedestrian access points were created. "This project was a unique undertaking by a municipality," Sudweeks said, "and is being looked at by many other cities as a model for their rivers." Ogden Mayor Mike Caldwell views the clean-up as a solid beginning, not the end. "We want to go beyond that 1.1 mile." When the northern Utah city experienced heavy rains during the spring of 2011, the project's benefits came into focus. "We survived 18 straight days of a 125-year flood event," Caldwell said. "Without those upgrades, the river would have jumped its banks and damaged a lot of downtown. 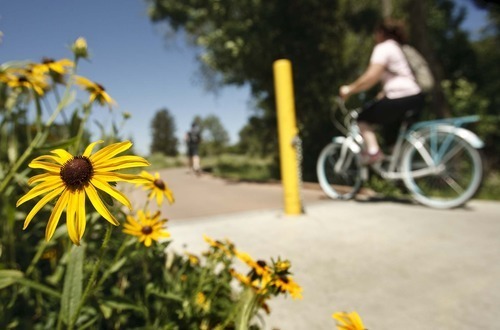 "Riverside trails now draw bikers, joggers, dog-walkers and families with strollers. The flowing waters also give kayakers and floaters a thrill, making the area a social destination as well as an economic driver to revitalize the city. 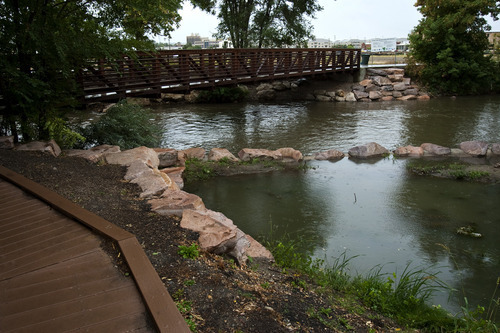 Kari Lundeen, an environmental scientist with the state Division of Water Quality, said the successful project caused her agency to add a category to its beneficial use designation of such waterways: swimming. "Before, people didn't swim in the Ogden River and now they are," Lundeen said. "So we need to try to protect it to that level." Ogden is the first municipality to receive the Sudweeks honor, an award now in its 24th year that is normally given to individuals. He has only presented it in person one other time, to former Division of Water Quality Director Don Ostler in 2005. "We have such tremendous respect for [Sudweeks]," said current Division of Water Quality Director Walt Baker, "and we thought it would be wonderful for him to present the award this year to an entire community and not an individual."